What is green woodworking, and why do it? 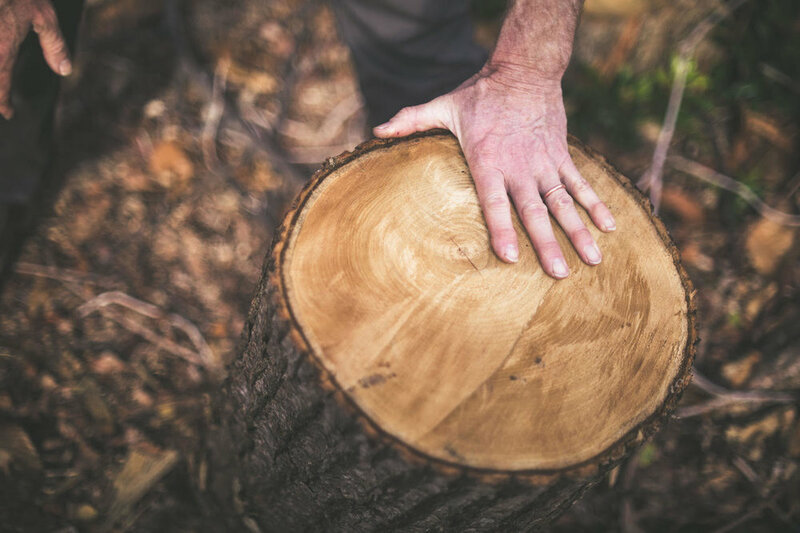 Green woodworking is the method of taking a freshly cut tree, and splitting it along its grain to make furniture and other products. Typically a log of between 10cm - 25cm is used, and timbers such as ash, sweet chestnut, cherry, beech and oak are used. Many other timbers can be worked this way, with the notable exceptions of elm, Hornbeam, London plane and other trees whose grain is too interlocked to split successfully. Large diameter logs can also be split with enough helpers, some hefty mallets (or “beetles”) and a good quantity of oak wedges (or gluts). Cleaving a big oak tree for the Sharpham Bench Project - you can see more about this project by clicking on the picture. There are any number of reasons for making furniture the way I do, but principal for me are the aesthetics of green wood furniture. There is something natural and honest about a piece of wood that has been cleaved from a round pole, and shaved by hand with sharp tools. The nuances of each piece - the undulations of grain, medullary rays on the radial faces, the dips and mounds as the grain encloses knots, or the beautiful ripples that develop under the tensile and compressive forces that build up on curves. With practice and a little luck these can be read in the log before it is split. Back detail of ash lath back chair. The main advantage of green wood is that it can be split. When green wood is wet the lignin in it is soft, and allows the wood to split easily. Dry wood is brittle when wet, and splitting it often results in cracking, rather than a controlled split. This means you can retain the natural shape of the tree. The saw is no respecter of grain, and just slices across it where it is told to. Cleaved wood is stronger than sawn wood, as there is always a continuous line of grain running through the piece. This means components can be made smaller in diameter, and consequently lighter. Green wood is usually bought from small, local woodsmen. Using small diameter trees means it easier to transport, and energy costs are kept down further by converting it into component parts by hand. Working wood green is a healthy, physically rewarding activity that can be carried out in the woods, workshop, or front room! There is no dust generated from cleaving and shaving, and the shavings can be put to use lighting fires, or providing mulch for the garden. I am experimenting with using mine as an environmental packaging material. London Plane shavings made by a tenon cutter. Green wood usually comes from coppice. 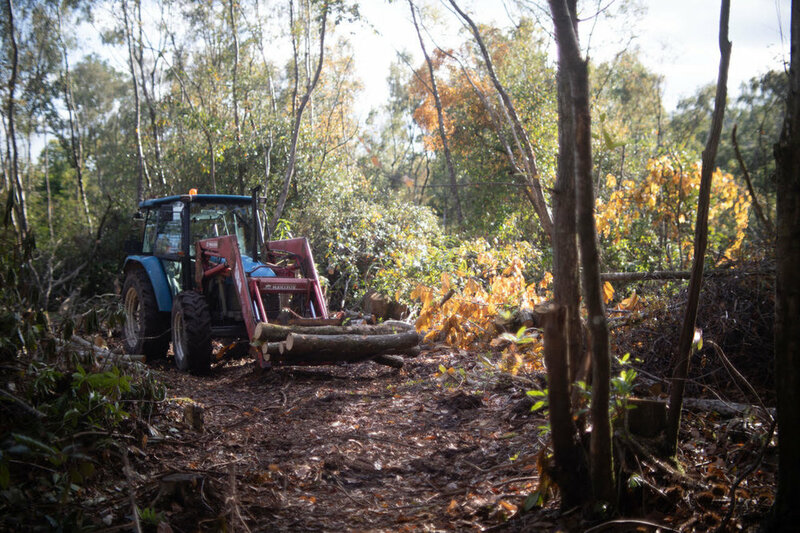 Coppicing is a traditional form of woodland management which works harmoniously and sustainably with the natural environment. Young trees are felled, opening up the canopy and maintaining the root system of the tree. New shoots soon sprout from the stump. Coppicing is vastly superior in terms of bio-diversity to un-managed woodland. I hand pick my stems from a well-managed local wood whose owner is always delighted his “wonky bits” are put to good use. 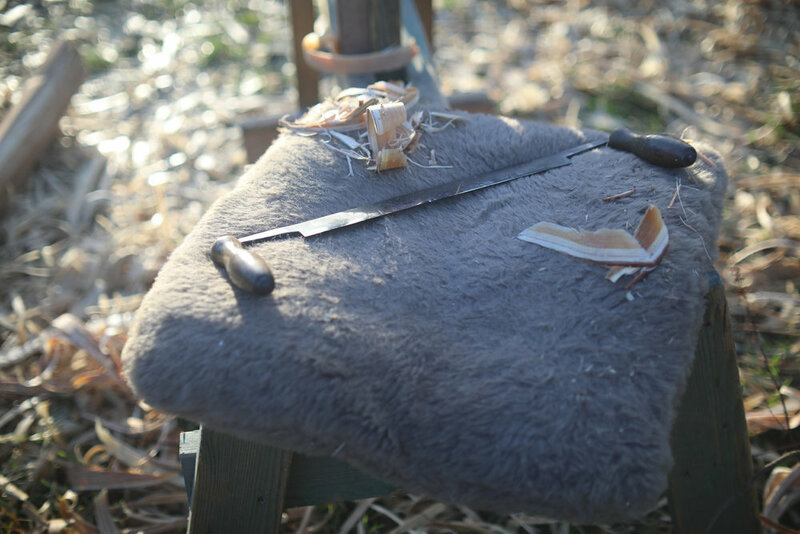 A piece of sweet chestnut, held in the cleaving break, being split with a froe. Clearly showing the way the split follows the grain. This is only possible in green wood, and is one of the main advantages, and joys of working this way. I run award winning courses from my beautiful workshop in South Devon. 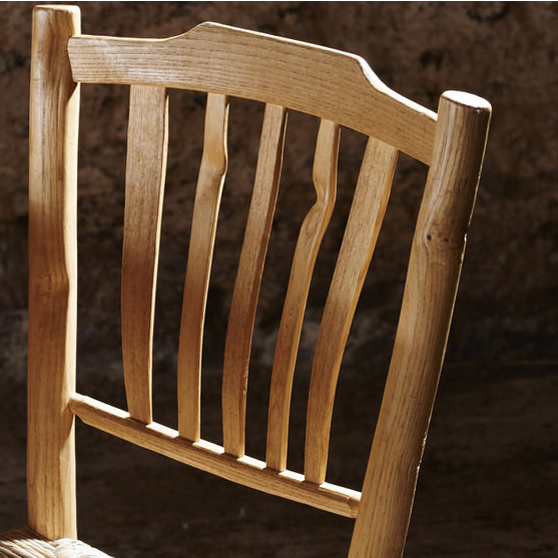 Check out my green wood furniture courses if you fancy some practical, hands-on learning about green woodworking, and take away a gorgeous hand-made family heirloom. Or click here to see more of the ways i use green wood in my furniture. A fusion of green wood and fine furniture.